"A compellingly intelligent account of the crises in family life that lead to rupture. Ellen Sucov writes with lucid passion about the many dimensions and expressions of such rifts, drawing on material from professional literature, from biblical and literary narratives, and from the experience of real families, including her own. She analyzes with great insight the dynamics of such estrangements and the reconciliations that sometimes emerge from them. Vivid and wise, her book will enrich anyone who has lived in a family and has reflected on its familiar strangenesses." 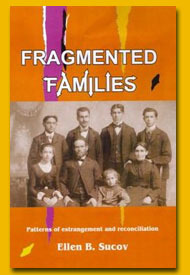 Fragmented Families is a "splendid blend of theoretical insights, cultural awareness, and practical advice. The author's ideas come through clearly, lovingly, and to the point. This book is a valuable resource for mental health professionals and others who work with discordant families. It will be a source of inspiration to families who have experienced the pain of estrangement." I found a copy of your wonderful book in my mail box last week, and I had the pleasure of recommending it from the pulpit (something I very rarely do) this past Shabbos. Most every reader can relate to the experiences in your book and learn from them. Those few who have not had similar experiences can read your book and count their blessings! May Hashem give you much success!